Commercial Bamboo Farming in Okeechobee, FL! We recently added more Commercial Bamboo Farming Acreages in Okeechobee, Florida! This Family also became our partners in JARRED BAMBOO SHOOTS DISTRIBUTION. They purchased a property of 70 acres, dedicated exclusively to Commercial Bamboo Growing. Check out the Facebook Post below for more info! https://www.onlymoso.com/wp-content/uploads/2019/04/56161297_2014713021987628_8283710544850976768_o.jpg 640 1315 Roberto Seminara https://www.onlymoso.com/wp-content/uploads/2016/06/logomenu.png Roberto Seminara2019-04-04 08:16:392019-04-04 08:16:39Commercial Bamboo Farming in Okeechobee, FL! Growing and Maintaining Bamboo: A Quick Guide! A versatile, income generating crop, bamboo has thousands of potential uses that the world is just waking up to. Bamboo shoots can be harvested and sold, or farmers can cultivate the full-grown grass and sell wholesale to industrial and commercial buyers. This makes bamboo ideal for investments! Anywhere in the world with temperate climates is perfect for growing bamboo. It is definitely not a delicate prairie plant. Bamboo is the largest variety of forest grass and requires humidity. Bamboo thrives in 30 inches of rain per year, in the summer. In winters, it’d rather be left alone. All in all, if your soil can grow corn, it can definitely grow bamboo. For starters, install some kind of barrier around your property to keep the plant from spreading. Not all species of bamboo run, but if you are planting it in a home garden or another premium space, even clumping species may require a restrictive barrier. Bamboo is best planted during spring, because this gives them a long growing season to take room until winter arrives. Start off by digging a hole that is twice the width and half the depth of the root ball. We realize that precision isn’t possible, but do your best. Add drainage material and don’t forget to use organic fertilizers. If planting in a dry area, set the plant in a bit of a depression. Otherwise, plants in high rainfall areas can be mounded slightly. Also, once planted, water the plants generously with mulch and compost. Your plants must be well-watered for the first two years. While bamboo plants are greedy feeders, one decent change with an all purpose organic fertilizer should be more than enough to last all spring. However, bamboos don’t like salt, so keep away from seaweed based fertilizers. If you limit the nutrient intake of a bamboo plantation, you can limit its growth and height. Regularly remove weak, old and damaged culms. You will find them to be dull in color than the rest of the plant. Just cut them off at the base, closest to the plant. It will help allow more air and light to reach your bamboos, ensuring a healthy, happy bamboo farm. 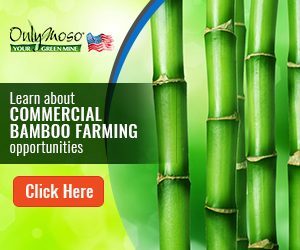 If you are interested in learning more about commercial bamboo farming and Only Moso’s offerings, visit us today! https://www.onlymoso.com/wp-content/uploads/2018/07/IMG-20180530-WA0014.jpg 900 1600 Roberto Seminara https://www.onlymoso.com/wp-content/uploads/2016/06/logomenu.png Roberto Seminara2016-10-29 11:30:492019-03-27 15:52:01Growing and Maintaining Bamboo: A Quick Guide! From textiles to construction, bamboo has thousands of uses and scientists continue to discover more. What was considered an exotic plant from China is now being hailed as “the timber of the 21st Century”. It absorbs huge amounts of carbon dioxide, and is a major food source for millions of people across China and India. And to top it all off, bamboo cultivations are a dependable source of cash for some of the world’s poorest people. You can buy a pair of socks made from bamboo, or use the strongest grass/plant ever as a load-bearing structural beam for your building. There is a lot that can be done with bamboo! And it’s unrivalled capacity to grow 3 feet or more in a matter of months make it highly sustainable and renewable form of energy. Growing bamboo plants for industrial use can be lucrative for farmers because industries and many commercial ventures are now looking into replacing their usual materials with bamboo due to its exceptional qualities. After all, bamboo grows very quickly, and reaches maturity three times faster than hard woods. It is also renowned for being as strong as steel. It’s lightweight, very flexible and one of the strongest naturally-present materials of all time. And as manufacturers and businesses become more interested in sustainability and lowering their carbon emissions, natural materials such as bamboo are setting up to experience their own age of renaissance. Are You Ready To Plant & Cultivate Bamboo? You will of course, need expert knowledge of bamboo reproduction, specialization in selective breeding of the right bamboo species and professional guidance on doing it right the first time. It is important to understand that bamboo is only a type of woody grass, and once planted, can spread quickly to surrounding areas. Bamboo farmers know how to limit the read of their bamboo cultivation and ensure profitable yield despite that. There are more than 1,200 species of bamboo growing across the world. However, Moso Bamboo is the fastest growing and most commercially lucrative species of Bamboo. Here at Only Moso, we guide you through planting and cultivation of the Giant Bamboo species that is idea for South American, European and American climates. If you’d like to learn more about the best way to grow bamboo indoors or outdoors, we can help! It has a centuries old reputation for being an exotic ornamental plant with almost super natural strength and capabilities. Many of us relate bamboo to plantations in China; however, it is also catching on fast as a farm crop in much of the United States. In fact, bamboo adapts well to the South, i.e. Virginia to Florida. It has also been spotted growing well along the Gulf Coast to Texas; West Coast bamboo is also viable with plenty of summer watering. Bamboo is also being grown in many areas of Puerto Rico and Hawaii. However, commercial bamboo farming still hasn’t caught on and many of these farms are growing bamboo on smaller basis. Bamboo Plants Make For An Awesome Investment! In addition to a lucrative business, bamboo plants also ensure better privacy for suburban and urban dwellers. Bamboo plants are evergreen, beautiful and grow to their full height in 3 years or less, depending on their breed. 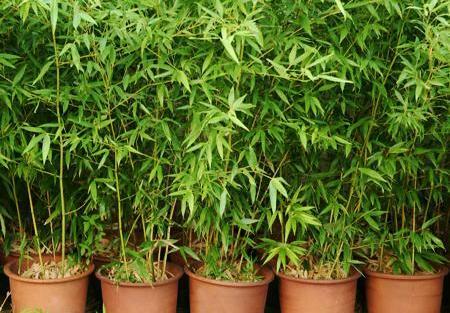 You may even decide to sell bamboo starter plants to other interested farmers like yourself. Or you can sell off the full harvest to builders, designers, industries and hundreds of other potential buyers. To top it all off, bamboo doest take a lot of space to grow; we have had farmers who had their entire stock occupying a 12-foot paved area alongside their houses in Oregon. And finally, Moso Bamboos are grown, harvested and shipped to hundreds of locations across the world, so you can rest assured that these work! Many varieties of bamboo are drought-tolerant, and may spread faster once established even with supplemental irrigation during dry periods. However, it is always a good idea to plant bamboos at moist, low-lying areas. The soil will still need to be drained well, however temporary flooding holds no danger. 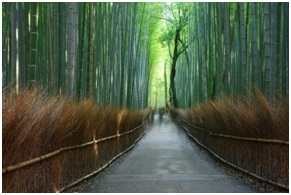 Selecting the right bamboo can significantly affect the outcome of your investment. Moso bamboo offered here is the fastest growing species of bamboo and it is perfectly adaptable to different soil and weather conditions across the world. The larger varieties of bamboo prefer sunlight but can also do well in areas with open shade. If you are looking for bamboo farming help, Only Moso is here to offer you a range of information and ideas! Get in touch with us today to learn more! Bamboo Plants: Industrial and Commercial Uses! Bamboo has been an important part of the human history, leaving its impact across cultures from thousands of years. The Chinese consider it a symbol of fertility, while it’s a symbol of friendship for the Indians. All in all, this extremely tall grass has quite a cultural significance for many cultures all over the world. However, it is interesting to note that bamboo is no longer considered a poor man’s timber. While it was traditionally used as a low-cost material for house construction, tools, vegetable and ornamentation, it has now an established commercial value as a dependable substitute for timber while also being useful as an engineered product. Bamboo is the material of choice for a number of high-value products. According to a UNEP report, there are more than 2000 uses. Another Chinese report showcases more than 10,000 uses for the tall grass! As the world continues to become more environmentally-conscious, bamboo is increasingly considered the green material of choice for construction purposes as well as for making paper, and a breathable fabric as soft as silk. T-shirts, jeans and even lingerie nowadays are made from bamboo fabrics. Bamboo is also a source of bio-energy because it is a clean and renewable energy alternative. 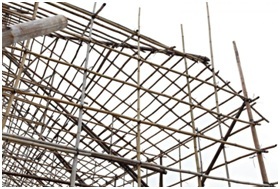 Commercially, bamboo can be used to make furniture as well as building and roofing materials. You can easily find fencing poles, floor tiles, walls and ceiling panels, scaffolding, frames for doors and windows as well as window blinds. Bamboo also serves the paper and pulp industry. It can be turned into toilet paper and also cardboard, helping conserve the world’s finite resource of trees. The textile, chemical and eatables industries convert bamboo into fabrics, biochemicals, wine, vinegar, and pharmaceuticals. Bamboo Can Be Grown Commercially In The U.S. It is a remarkable plant that offers some amazing income-generating opportunities. It grows extremely fast and farmers can sell it as a raw product or even make products out of it affordably because it doesn’t. And what’s even better is that it doesn’t require any fertilizers or pesticides for healthy growth because it has no real threat from pests or even diseases. Once it is planted, you can forget all about it until its harvest time. If you’d like to learn more about commercial bamboo production and the best way to grow bamboo indoors, visit us at Only Moso. The website offers extensive resources on planting and harvesting one of the fastest growing bamboo plants ever! Visit the website to learn more. https://www.onlymoso.com/wp-content/uploads/2016/06/logomenu.png 0 0 Roberto Seminara https://www.onlymoso.com/wp-content/uploads/2016/06/logomenu.png Roberto Seminara2016-10-26 09:41:062018-01-29 12:25:49Bamboo Plants: Industrial and Commercial Uses!